Today Mary Hams – one of the founders of Banksia Park Puppies at Stradbroke – will celebrate her 90th Birthday! Just looking at her and her immaculate house and garden you would never guess she was a day over 60! Still fit and agile, she loves to get out and about to tend to her plants and chooks, with her dog Roxy close by and her rescued sheep Rambo wanting yet another feed. Our team members love to stop and have a chat with Mary as they walk the dogs past her house. Scrabble with her friends every week keeps her mind sharp and she’s never short of a witty comment or wise advice! She is still determined to do her own shopping and won’t even let you push the trolley, but this tenacity is what helped to start off Banksia Park Puppies at its current Stradbroke location nearly 30 years ago! Mary’s son Colin had been breeding dogs for the pet industry for over a decade before that and his wife’s dad Alan had been breeding working dogs and then companion dogs since the 1950’s. Colin later moved the family’s dog breeding business to Stradbroke, Victoria in the early 1990’s. The environment is more favourable here in Stradbroke, with even temperatures, lower rainfall compared to other parts of Gippsland and sandy soils, which is ideal for good drainage to reduce the chance of potential waterborne diseases. When Banksia Park was in its early stages Mary lived on the property by herself taking care of the puppies and parent dogs at night and on the weekend when her son Colin was travelling to and from Trafalgar. Over the years the successful family business has grown and now 4 generations of Hams’ reside at Banksia Park! Mary has long retired from the business but is always influential with her moral support, level-head and witty advice. Colin is still actively involved as one of the Managing Directors and his supportive wife Kay is well known in the local area as a most loved Primary School teacher, and for her volunteer and charity work which the family is extremely proud of. The reigns have now been passed onto their son Matt who has grown up with puppy breeding in his blood, and along with his wife Kirstin are the Managing and Operational Directors and the face of the brand; you most likely have seen them on the news or heard them on the radio. They live here with their two children, Bella and Diesel who have grown up on the property and enjoy inviting friends and family over to play with the puppies. On the weekend the family went above and beyond to pay respects to Mary with a spectacular birthday celebration fit for a Queen! A beautiful horse drawn carriage, lead by a bagpiper escorted Mary through the pines, across the road and through Banksia Park, stopping at Mary’s house. Over 70 guests enjoyed the afternoon with a traditional style high-tea and uncanny nice winter weather! Happy Birthday Mary, may we celebrate many more!! Today is the second day of our Mother’s day week! 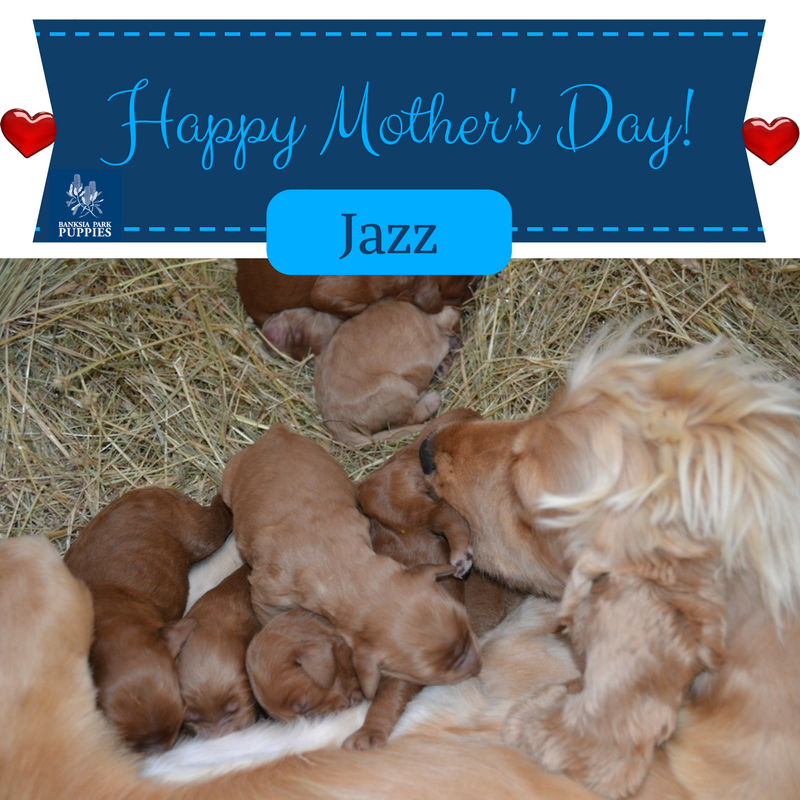 Happy Mother’s day today to our mum Jazz. Look at our amazing mum! She is gorgeous and loves a pat. She loves a run in our agility park when she doesn’t have puppies as you can see in the photos in the gallery below. Her puppies are healthy and happy and she is checking them all to make sure they’re all clean and growing. Did you know at this stage the puppies cant hear, see or go to the toilet on their own? Mum is doing alot at this age and Jazz is doing an amazing job that’s for sure! We had a good play with some of our puppies we’re keeping here at Banksia Park Puppies. One day they’ll be Banksia Park Dogs! Now they want lots and lots and lots of attention due to being in their critical socialisation period. This is where they do all their learning. So in this time we put loads of effort into training them, playing with them, patting them, and in general teaching them to be around people and kids. Here are some photos of these gorgeous puppies – Cuzzie, Muppet, Muffin, Harlow, Harsha, Harper, Poko and Harlee. It was a big day last Sunday at Banksia Park Puppies, both of the owners of Banksia Park Puppies, Colin and Matt, received 15 year service awards at a ceremony for the local CFA brigade. Giving back to the community is important to Banksia Park, and being a part of the CFA is a very important activity for us, especially living in the country in the bush like we do. Both Matt and Colin have been actively involved in the CFA for the last 15 years, participating in many training days as well as actively fighting many fires every fire season. This is a great service to the community. We take fire very seriously at Banksia Park Puppies, and urge all our followers to as well. Before the fire season starts this year, if you are in a high risk area, make sure you plan and prepare for it and know what you plan to do. Victoria is one of the most fire-prone areas in the world, and we need to remember this going into every fire season. Congratulations to Matt and Colin, and a big thank you to all the CFA volunteers for everything they do for us and all our communities across Australia.